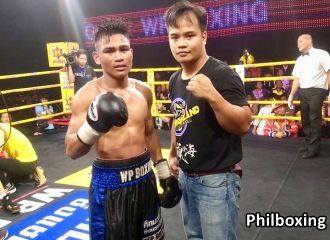 In an electrifying stoppage, Filipino Minimumweight Marco John Rementizo (9-3, 6 KOs) of Wowie Adnan Boxing Gym brutalized and stopped more experienced Thai warrior Siridech Deebook (17-5, 13 KO's) Saturday night (Dec 22) at the WP Studio in northern Bangkok, Kingdom of Thailand. The knockout came during the action of the 7th chapter when the southpaw Rementizo pressed hostilities forward with a vicious, powerful overhead right that landed full force on the chin of the Thai, blacking him out immediately into dreamland where he stayed for few worrisome minutes. Rementizo tried to follow that devastating right blow with a left hook, but Siridech was already backwards on the way down, landing flat on his back. Official Time of the TKO was 30 seconds into round 7. It was the second time during the rumble that Rememtizo rocked the Thai down to the blue WP Boxing canvas. The first knockdown was courtesy of a counter left hook to the side of the head of Siridech which propelled Siridech to the deck, landing on his left side. However, the strong Thai bravely got up from that first close encounter. But not from the second. The satisfying knockout win - which was televised live in the Kingdom of Thailand on WP Boxing - is the most important victory that the shy 19 year-old Marco John Rementizo has achieved in his one-and-half year pro boxing career. Just last October in Bangkok, Rementizo battled and lost by points in a close, hard-fought ten-rounder while challenging unbeaten Thai WBC Asian Champion Tanawat Nakoon (10-0, 4 KO's), but Saturday night, Rementizo is a winner. Rementizo's October loss in Bangkok explains why a number of Thai boxing fans at WP Boxing Studio guessed that Filipino would lose again to another tough Thai fighter. But young Pinoy warrior had other plans. Hailing from the City of Golden Friendship, Cagayan de Oro, Marco John Rementizo was assisted in his corner by experienced Filipino coach former boxer and MMA fighter Jayvee Jacinto Alipio, 34, of Hermosa, Bataan Province. The Filipinos had one heck of Saturday night ride. Afterwards, celebration with a well-deserved delicious Thai dinner. Congratulations. The author Carlos Costa is a Panama-born fight reporter living in Cebu. Carlos can be reached by email: carlos512@hotmail.com and whatsapp/viber: +639184538152.